I’ve been told (by an angry reader) to “check my facts” before posting stuff on my blog. The facts in question relate to a posting on this blog entitled “Ticket Chaos – an ICT failure or FIFA greed?” [30th May 2010]. In it I tried to make sense of the fact that the World Cup ticketing system had failed dramatically on 28th May – leading to a lot of bad press and public anger. As both an academic and a software engineer I’m dedicated to checking my facts … so let me try again on the subject of the World Cup ticketing system. 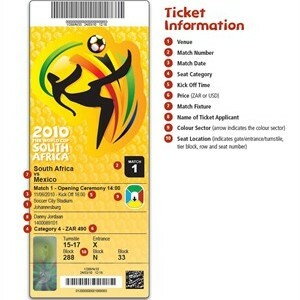 On 15th April 2010, a batch of World Cup tickets went on sale “over the counter” at FIFA Ticketing Centres, selected branches of Shoprite Checkers and FNB branches. The IT system crashed, making it impossible for many fans to buy tickets in this way. Jérôme Valcke, Secretary General of FIFA made a statement to the press in which he apologized and assured the South African public that FIFA’s IT service provider would investigate the problems and sort them out. On Friday 28th May the ticketing system crashed again when 90,000 additional tickets went on sale over the counter. There were numerous reports in the local and international media of “chaos” at ticketing offices. Hundreds of people had queued for hours – some of them over-night – in freezing wintery conditions, and walked away with nothing. There was a great deal of anger. In some instances police had to be called to restore order. Jérôme Valcke made another public apology and promised to get a report from FIFA’s IT service provider. These are the facts – the rest of the comments in my “Ticket Chaos” posting were speculation (I did make this point in my posting). In short I tried to understand in technical terms why a critical application like the World Cup ticketing system should crash so dramatically on two occasions? Why were the problems that resulted in the crash on 15th April not sorted out properly by 28th May? Were the reasons technical or financial? As a South African I strongly identify with my fellow South African football fans desperate to get tickets that would enable them to see games at those wonderful stadiums we’ve invested so much in building. I’m angry that they were let down by FIFA in this way. As a software professional I dislike the fact that the public were let down by an IT system and the professionals tasked with developing and maintaining it. Such failures, particularly when they are so visible, give all IT professionals a bad name. Since I’m not an investigative journalist, but simply a software engineer with a blog, I’m not able to provide more facts than these. I do have more information, but I will not post it on my blog since most of it is contradictory. This makes it hard to check my facts. I’m certain, however, that there is a lot more to this story. Either those who know the facts should share them with those of us who care … or an investigative journalist should set to work to find out more. In your original post you suggested that a local ticketing agent with local infrastructure may have been better suited to handling the problem. I am however afraid that the rot is deeper than it seems at first glance. I attempted to purchase tickets to the Super14 Final from our local ticketing agent Computicket in May. My brother was 2nd from the front in the queue at the local outlet and I had my 4MB DSL line to back up my onslaught. Immediately after ticket sales opened the Computicket site crashed. It came up in bursts and after 2 hours I managed to secure 2 tickets. By this time my brother was still in the queue, still 2nd from the front! Unfortunately the shopping basket on the site discards all items not paid for within 15 minutes, After 15 minutes of agony I lost my tickets and gave up. My brother was eventually turned away with I may add the guy in front of him. Being 1st in the queue was apparently not good enough.